To be completely honest, I’m exhausted. Since returning last weekend from the Blue River Writers Gathering hosted by the Spring Creek Project at H.J. Andrews Forest, all of my mornings and evenings have been given over to peeling, canning, juicing, and drying apples, pears, elderberries, grapes, and tomatoes. This pathological compulsion to preserve food is a sickness that I’m not anxious to heal. My pantry is filling with beautiful jars of food, and I believe in the sacredness of eating my own stuff—that it’s good for body, soul, and planet. Nevertheless, the week has gotten a little weird. I’ve been sleep deprived, late for work, forgot to take the garbage out, and this morning I didn’t even take time to pack a lunch. This means two slices to go from Tracktown Pizza down the street. I gush over good pizza. But eating out has never been a good use of planetary resources, and the irony of eating at the pizza buffet because homegrown food takes so much time is, well, delicious (sorry, I couldn't resist). Nor have I written a word this week before today, even though at the Writers Gathering Oregon Poet Laureate Kim Stafford encouraged us to engage in a daily writing practice as a way to “each day create a point of light in a dark world.” I admire his wisdom. 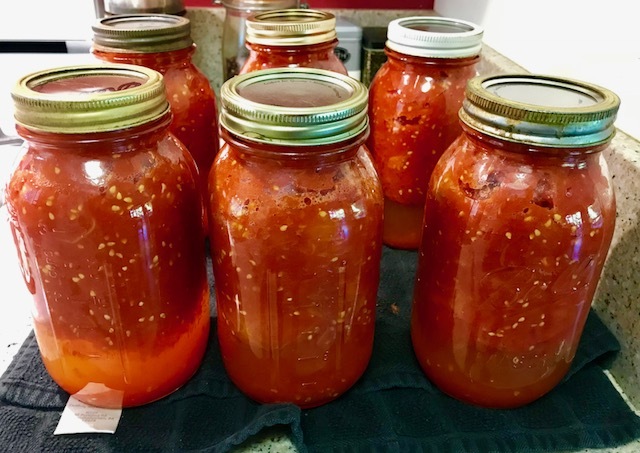 These days my points of light look more like golden honey-canned pears, black hole bottles of elderberry juice, and cooling jars of tomatoes the color of uncooked meat. Hopefully these are their own poetry, hot and clear and gleaming. Earlier in this marathon week of preservation, I dropped an uncapped jar of hot elderberry juice. It streamed like blood across the kitchen floor. A wise friend recently told me that after a loss Grief can reach up at any time from some unnamed cavern in our soul and grab us by the heart. That's the truth. Even though the jar didn’t break, I did, an outpouring of sorrow massively disproportionate to half a bottle of spilled juice. Luckily the wound was seeping and purple and venous, rather than pulsing and red and arterial. I didn’t bleed out, and after ten minutes or so was able to staunch the flow and get back into the game. I've grieved in my sleep, too. Dreams of my father rushed through dim canyons of early morning, sifting and scouring the rubble and bedrock of my being. These excursions into my subconscious are confusing, and I don't spend much time dwelling on them. Rather, I trust that when the rains finally come and the fish run, the spawning gravel will be clean and ready. This morning it was a relief to put away the canner.